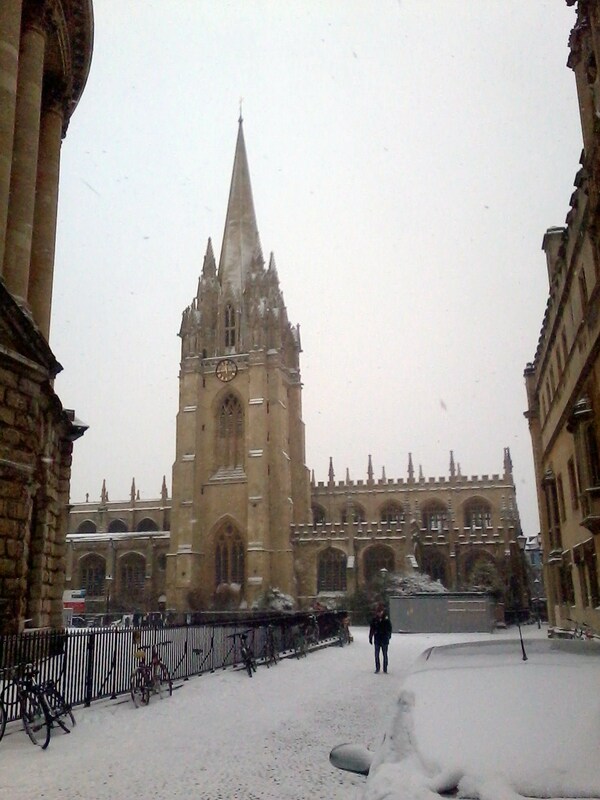 Oxford Erin: Snow Day in Oxford! Well, for the first time since we moved to Oxford, we had a proper snowfall. It came down just about all day and it stuck and it was glorious. Sort of. I hadn't realized just how much I missed winter - and snow. My little prairie girl heart positively bursts with delight when it snows. I feel calm, serene. The world gets softer and quieter somehow. This was the kind of winter day we dreamt about at home. Lovely falling snow in just sub-zero temperatures. I walked home from school (about a 45 minute-trek) and didn't get cold at all. Also, I think Oxford really deserves more snowfalls. The city looks utterly lovely under a nice white blanket. Snow on spires - snow on ancient stone walls - snow falling peacefully over churchyards. 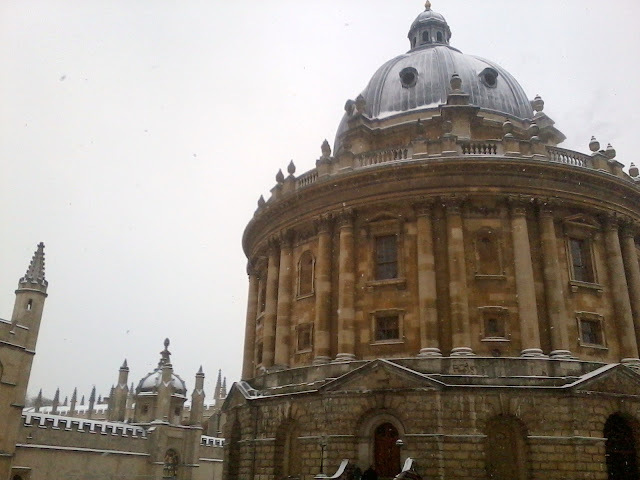 I made sure to take pictures, because I don't know how often I'll see Oxford like this. 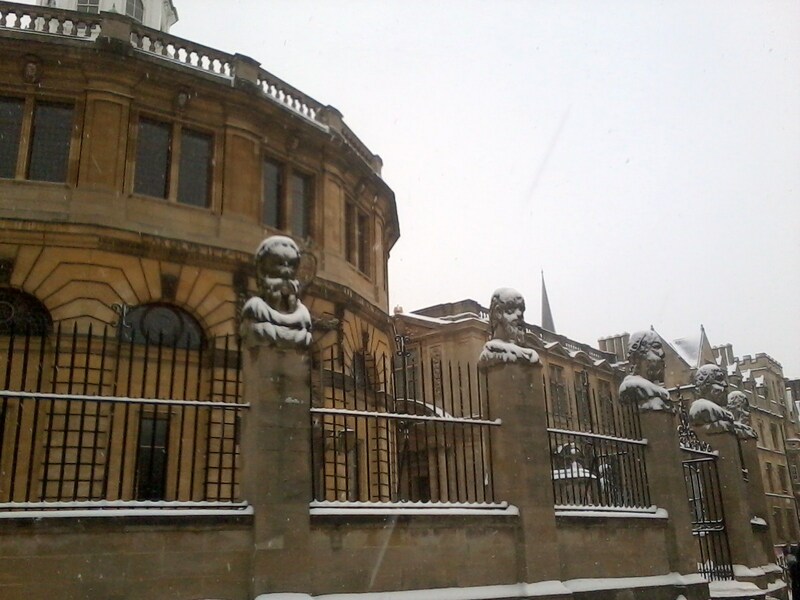 I quite liked how the snow settled on the busts of the old men in front of the Sheldonian Theatre. Now. The negative part of the story. 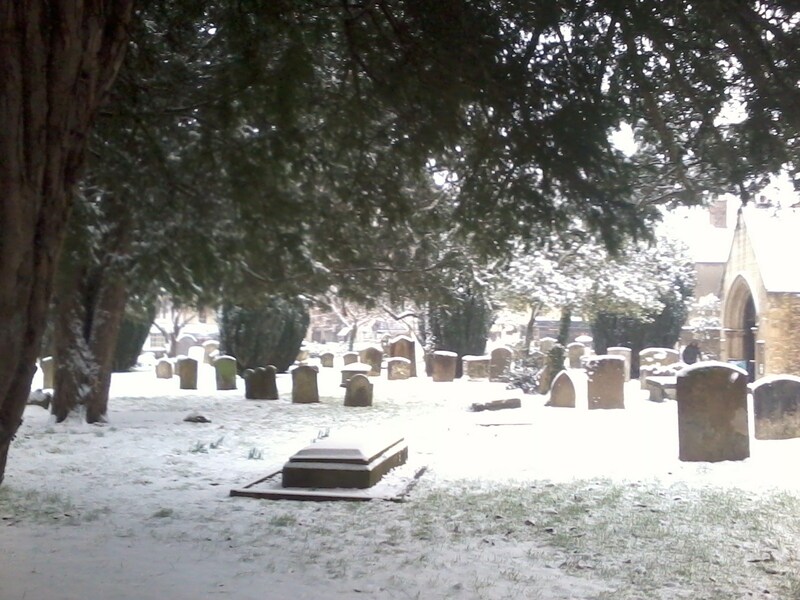 You see, the British don't get snow like this very often. 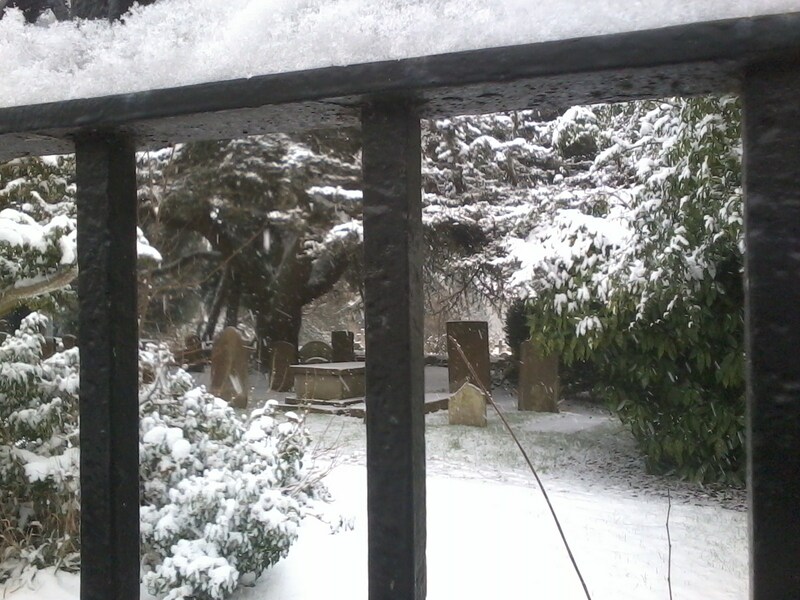 Today 10 cm/4 inches were expected to accumulate across much of England. Schools closed. 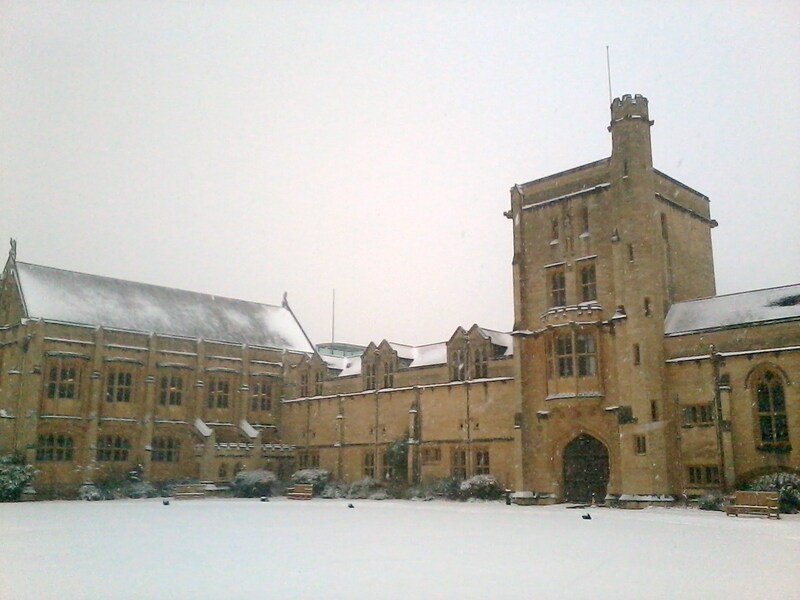 The Bodleian's library system closed at 3 pm. Trains and buses were cancelled and delayed. This is all rather annoying. Especially since at home everyone just drives slowly and it isn't really a big deal to have this much snow in a day. The only time parts of the University of Saskatchewan started shutting down during my undergraduate days was when Saskatoon had its worst blizzard in fifty years! So, I hope the snow sticks around (though it does mean I can't cycle down to school while it lasts) and that the weather-related disruptions end soon. 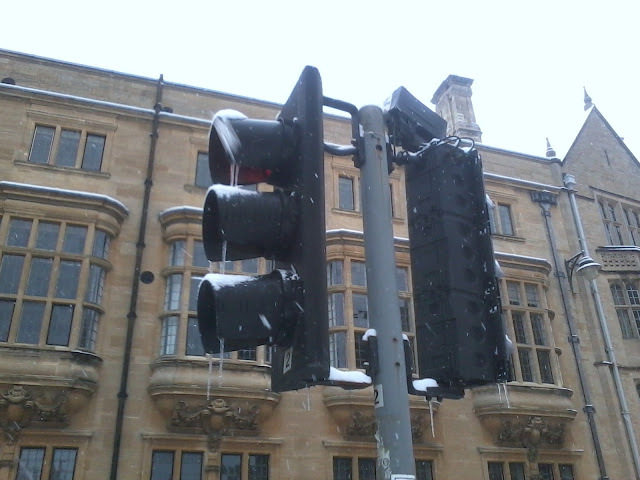 Also, perhaps the government and local councils should look into investing in more winter weather-related infrastructure? I am a fellow lover of snow. Winter is my favourite season! We had a warm spell here in Buffalo for a couple of weeks and it all melted away, but last night things cooled off and we got a lovely fresh dusting. Probably about the same amount as you did over there, but highs of -12. I bundled Maggie up and we walked to the library, which is about an hour round trip. She will be a winter lover too if I have anything to do with it!